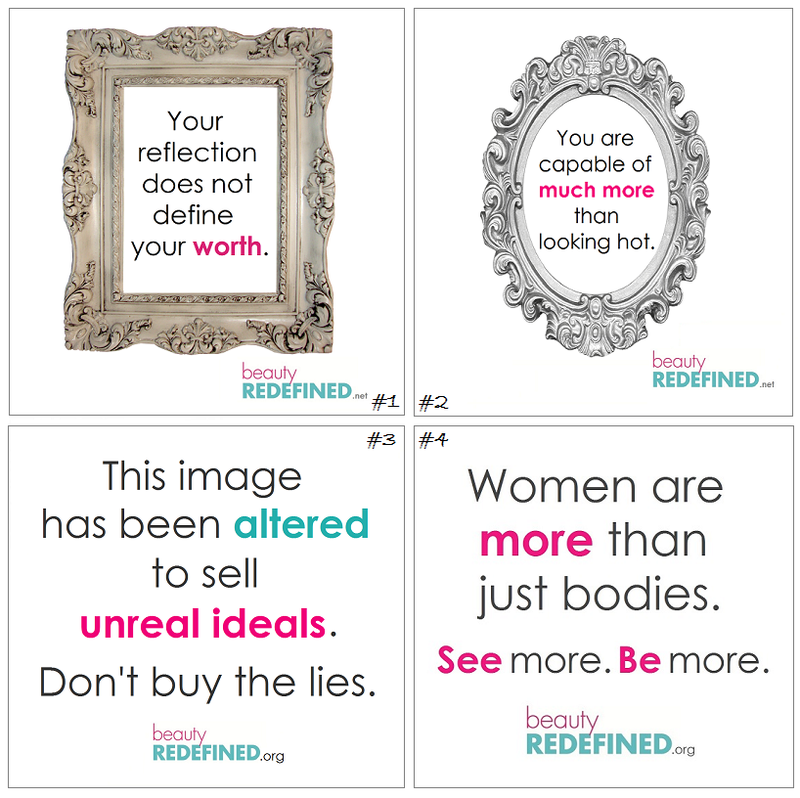 To move forward in our mission to redefine the meaning and value of beauty for women everywhere through speaking engagements, online education, and activism, we raise money by selling unique merchandise. We are a 501(c)(3) nonprofit, so all donations and purchases are tax-exempt. We’ll ship this stuff within 2 weeks of whenever you submit the order. If you’re in a big rush and need these in time for an event, contact us and we’ll figure expedited shipping costs if necessary and get it in the mail ASAP! Please check out our products below, and watch for new products as we continue adding them! Every bedroom and bathroom mirror should carry a positive mantra to help counteract the negative script that so often runs through our minds when we see our reflections. As a gift for a friend or loved one or a happy reminder for yourself, these clear decals with our uniquely empowering messages will improve any reflection! Shipping: For U.S. customers, shipping is $3 and automatically added to your order. For international orders, please donate at least $6 to cover shipping costs by following the “Donate” button at the bottom of this page or at the page you’re redirected to upon submitting your order. Otherwise, we’ll send you a nice message requesting help with shipping! Whether you want to post our happy sticky notes around your own house, office or school or pass them out to family, friends, students or the girls on your soccer team, we know you can put these positive messages to great use! Shipping: Shipping for U.S. customers is $3. For international orders, please donate at least an additional $5 to cover shipping costs by following the “Donate” button at the bottom of this page or at the page you’re redirected to upon submitting your order. Otherwise, we’ll send you a nice message requesting help with shipping! BEAUTY REDEFINED BRACELETS – sale! Wear these bright, fashionable braided faux leather cord bracelets as a personal reminder that YOU are Beauty Redefined! Each bracelet wraps around your wrist twice and comes with an oval pewter charm with the words “Beauty Redefined.” Wear multiple bracelets at once and pass along the rest to friends or family who could use a cute, wearable reminder that they are beautiful and so much more! Our 5.5″ x 4″ note cards come in our two most popular and inspiring designs on the front and are lined on the back for you to write a nice note to anyone who needs a boost! How many of each design? Shipping: Shipping for U.S. customers is $3. For international orders, please donate an additional $5 to cover shipping costs by following the “Donate” button at the bottom of this page or at the page you’re redirected to upon submitting your order. Otherwise, we’ll send you a nice message requesting help with shipping! If you’d like to support our cause through a donation in any amount, we would be unbelievably grateful. You can do so using any card, check or PayPal account using the button below. You’ll also receive a small thank you gift from us for doing so. Thank you, and we love you!